ROME (AFP) — A prosecutor in Bolzano, northern Italy seized wine bottle labels on Wednesday bearing a portrait of Hitler and other Nazis from a winery near the Austrian border, the company said. The 20 labels from the "Der Fuehrer" line show Hitler raising the Nazi salute and his generals, including Hermann Goering, the Reich's economic minister, Heinrich Himmler, the head of the Gestapo, and Rudolf Hess, Hitler's deputy. The black and white labels are imprinted with the mottoes "Ein volk, ein Reich, ein Fuehrer" (one people, one empire, one Fuehrer) and "Sieg heil", a slogan proclaimed by Hitler as a greeting or in front of the masses. The incriminating labels constitute a glorification of the perpetrators of crimes against humanity, according to state prosecutor Cuno Tarfusser. The Lunardelli company said it had sold around 20,000 bottles featuring the Hitler labels per year. It also sold wine with images of Mussolini on the label, which were not seized by police. 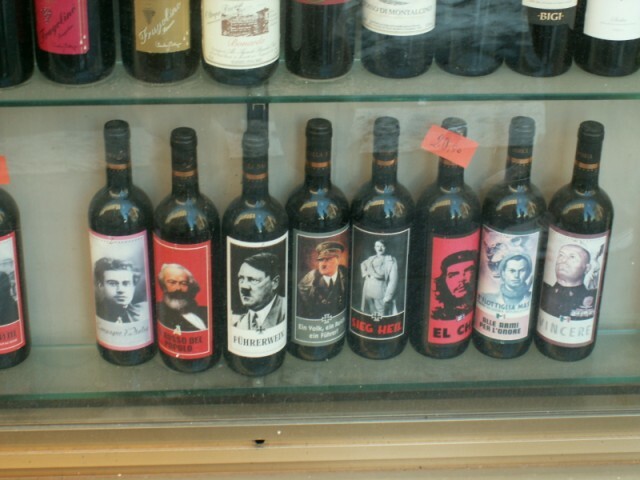 The bottles make up part of a product line started in 1995 called the "historic collection", selling wine with labels with the faces of Winston Churchill, Antonio Gramsci, an Italian Marxist philosopher, Adolph Hitler, Karl Marx, Napoleon Bonaparte, Benito Mussolini, and Che Guevara. The line stirred up controversy back in September 2003, when German Justice Minister Brigitte Zypries made an official protest against its sale. At the time, she claimed that the labels referring to the Third Reich were "abominable and in bad taste." A while back I started brewing my own wine, I have really started getting into it and now actually sell my wine to friends and family. I wanted to add that extra touch to my wine so I designed my own wine labels and had them printed by a british labels company who did a excellent job. It has made my wine bottle look really great!